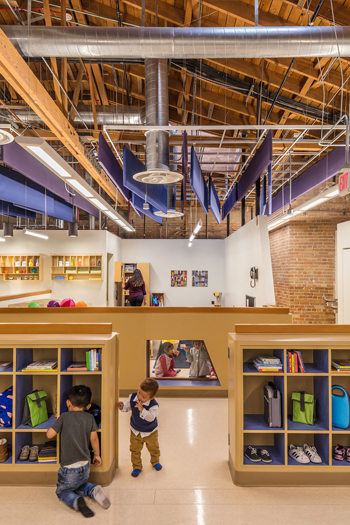 This adaptive reuse project transforms a 110-year-old brick and bowstring truss soundstage into a colorful landscape of spaces for a new Early Head Start Center. The preschool serves 64 children in nine classrooms and two playgrounds in a dense site In East Hollywood. The openness of the interior is an important factor in the success of this learning environment; daylight permeates the space and strong visual communication between classes supports teamwork among caregivers. Architectural features emerged from the challenges of renovating this site. Color and shape at new shear walls become primary visual and spatial elements for the center. Supports for original masonry walls become surfaces for artwork. The landscape of colorful baffles responds to acoustic challenges at the interior; the shapes reappear as shading devices at the playgrounds. LA Promise Neighborhood grants empower agencies such as YPI to provide a range of services to the surrounding community. This preschool site has evolved into a neighborhood center, sponsoring nutritional counseling, literacy promotion and parenting classes.